Synopsis, taken from dust jacket of the book: Meghan Chase has a secret destiny - one she could never have imagined...Something has always felt slightly off in Meghan's life, ever since her father disappeared before her eyes when she was six. She has never quite fit in at school...or at home. When a dark stranger begins watching her from afar, and her prankster best friend becomes strangely protective of her, Meghan senses that everything she's known is about to change. But she could never have guessed the truth - that she is the daughter of a mythical faery king and is a pawn in a deadly war. Now Meghan will learn just how far she'll go to save someone she cares about, to stop a mysterious evil no faery creature dare face...and to find love with a young prince who might rather see her dead than let her touch his icy heart. Last month, when I reviewed Lesley Livingston's Wondrous Strange, I said that it was finally the type of faerie book I'd been looking for that I hadn't been able to find. I can honestly say the same thing about The Iron King. With an original plot, great, solid characters, action, romance, suspense and humor, it is definitely high on my list of new favorite faerie books - actually, new favorite books, period. 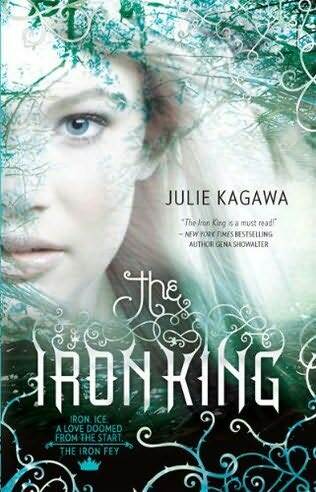 Besides the things I just mentioned, the plot has great twists and turns that kept me wondering throughout, and has me itching to read the next book in the series, The Iron Daughter. I thought the whole concept of the story was not only brilliant, but well executed. So many stories have a great concept but fizzle on the execution - it's obvious that Ms Kagawa put a lot of thought into the plot, which made for a unique story. If you're familiar with faerie lore, you'll recognize some familiar characters in the faerie royalty - Oberon, Titania and Mab - but the way they're written, they're completely fresh and different. I couldn't decide on a favorite character because I liked them all, but especially the main four characters, Meghan, Robbie, Ash and Grimalkin. Meghan feels invisible and forgotten, her only real friend is Robbie, and she feels held back in her life, not only because she feels like she doesn't really matter, but also because her family is so poor. She makes the best of it, trying not to care too much about what others think, but it still affects her. Throughout the story, she shows that she's strong and capable and doesn't need anyone's approval. As for Robbie and Grimalkin (who's a faerie cat, by the way), they're both hilarious characters. I love how Grimalkin is devious, but despite that he comes to care for Meghan. Ash is dark, mysterious, dangerous and haunted, which of course makes him the perfect love interest, and he's definitely one of the reasons I can't wait to read the next book! I have read all kinds of good reviews on this and I can't wait to read it! It is definitely in my TBR pile! Thanks for the great review!